We’d love your help. Let us know what’s wrong with this preview of Beyond the Black Door by A.M. Strickland. Everyone has a soul. Some are beautiful gardens, others are frightening dungeons. Soulwalkers―like Kamai and her mother―can journey into other people's souls while they sleep. But no matter where Kamai visits, she sees the black door. It follows her into every soul, and her mother has told her to never, ever open it. When Kamai touches the door, it is warm and beating, like it has a pulse. When she puts her ear to it, she hears her own name whispered from the other side. And when tragedy strikes, Kamai does the unthinkable: she opens the door. To ask other readers questions about Beyond the Black Door, please sign up. Hey all! Now that the cover is out in the wild, I figured I’d share a bit more insider-info about BEYOND THE BLACK DOOR. This is a YA dark fantasy with court intrigue, assassinations, fancy dresses, twisty romance, evil love interests, a fair bit of blood, and cool stuff like bottomless staircases in endless dark castles. It should appeal to fans of Beauty and the Beast retellings (though it’s not a retelling, itself), Phantom of the Opera, and Labyrinth. Also, there are lots of queer characters Hey all! 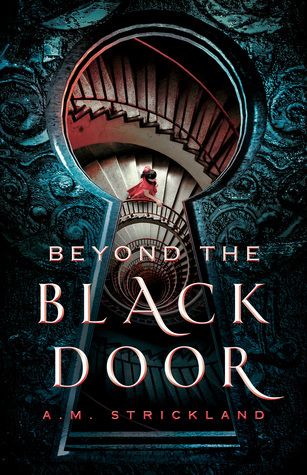 Now that the cover is out in the wild, I figured I’d share a bit more insider-info about BEYOND THE BLACK DOOR. This is a YA dark fantasy with court intrigue, assassinations, fancy dresses, twisty romance, evil love interests, a fair bit of blood, and cool stuff like bottomless staircases in endless dark castles. It should appeal to fans of Beauty and the Beast retellings (though it’s not a retelling, itself), Phantom of the Opera, and Labyrinth. Also, there are lots of queer characters: a demi-biromantic asexual main character, an ace love interest, and ace/trans and gay side characters. Also, it has specifically ace romance. -Lots o’ physical violence in general—people getting stabbed to death, kidnapped, hit, etc. The ace YA JUST KEEPS COMING YES GOOD GIVE ME ALL YOUR ACES. *tagging this as it has an ace mc I believe? I don't know anything about it but it's ownvoices asexual rep and I want to read it. Wickedly dark and wonderfully unique. I couldn't put it down!!! "a main character coming to terms with her asexuality"
WHERE DO I SIGN UP ???? how did i not know this had an ace spec. mc? ?